1810~1833: born in the province of Echigo. He is adopted by the great Edo star Ichikawa Danjûrô VII, receiving the name of Ichikawa Shinnosuke and becoming the zamoto of a children-actors troupe in Ôsaka. 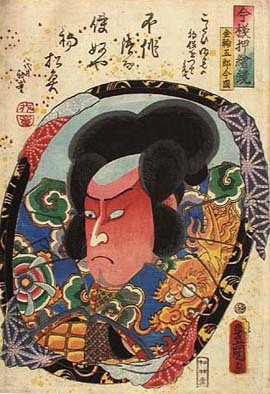 He has a quarrel with Ichikawa Danjûrô VII, leaves the Ichikawa clan and performs under the name of Mimasu Iwagorô. The Kamigata star Arashi Rikan II takes him as a disciple and gives him the name of Arashi Kitsujirô. 1833: Arashi Kitsujirô is adopted by Kataoka Nizaemon VII received the name of Kataoka Gatô I (Gatô is a haimyô used by Kataoka Nizaemon VII). 3rd lunar month of 1837: his adoptive father Kataoka Nizaemon VII dies. 7th lunar month of 1837: Gatô plays the role of Koganosuke in the classic "Imoseyama Onna Teikin", which is performed in Ôsaka at the Ichinogawa Shibai. 9th lunar month of 1837: Gatô plays 3 roles in the drama "Ume no Naniwa Hayazaki Genji", which is staged in Ôsaka at the Ônishi no Shibai. He also plays the role of Kitanoya Shichibei in the drama "Sekitori Senryô Nobori". His stage partner in the role of the sumô wrestler Iwagawa Jirokichi is Arashi Kichisaburô III. 1st lunar month of 1839: Kataoka Gatô I takes the name of Kataoka Gadô II (Gadô was another haimyô used by Kataoka Nizaemon VII, who is considered as Kataoka Gadô I). Premiere at the Kado no Shibai of Nishizawa Ippô's drama "Keisei Hama no Masago"; Gadô plays the roles of Mashiba Hisatsugu, Kofuna no Gengorô and Kumai Gengorô [casting]. 3rd lunar month of 1839: Gadô plays at the Naka no Shibai the role of Honda Dainaiki in the drama "Igagoe Dôchû Sugoroku". 1st lunar month of 1840: Gadô plays at the Naka no Shibai the roles of Kiura Shingo and Masaemon in the drama "Keisei Setsugekka". 8th lunar month of 1840: Gadô plays at the Naka no Shibai the role of Oguri hangan in the drama "Hime Kurabe Futaba Ezôji". 10th lunar month of 1840: Gadô plays at the Naka no Shibai the roles of En'ya Hangan, Yomoshichi, Teraoka Heiemon, Jûnai and Takakura Hayato in the drama "Hana Kaede Iroha Hyôban". 11th lunar month of 1840: Gadô performs in Ôsaka at the Kita-Horie Ichi-no-Gawa Shibai, playing in the dramas "Aburauri Kuruwa Monogatari", "Azuma Miyage Modori Kago" and "Go Taiheiki Shiraishi Banashi". 1st lunar month of 1841: Gadô plays at the Naka no Shibai the roles of Yodoya Tatsugorô and Hattori Kingorô in the drama "Keisei Yanagi Zakura". 4th lunar month of 1841: Gadô plays at the Naka no Shibai the roles of Sukune Tarô and Takebe Genzô in the drama "Tenmangû Natane no Gokû". He also plays the role of An no Heibei in the drama "Otokodate Itsusu Karigane". 5th lunar month of 1841: Gadô plays at the Naka no Shibai several roles, including Fukuoka Mitsugi in the drama "Ise Ondo Koi no Netaba"; the roles of Okon and Kisuke are played by Nakayama Yoshio III and Nakamura Shikan III. The performance is a commercial failure and some actors move to Kyôto. 11th lunar month of 1841: Gadô performs in Kyôto at the Kitagawa no Shibai, playing in the dramas "Keisei Yamato Zôshi", "Hachijin Shugo no Honjô" and "Daikyôji Mukashi Goyomi". 3rd lunar month of 1845: Gadô plays at the Kado no Shibai the roles of Yoshitsune and Ono no Tôfû in the dramas "Ichi-no-Tani Futaba Gunki" and "Ono no Tôfû Aoyagi Suzuri". 5th lunar month of 1845: Gadô plays at the Naka no Shibai the roles of Kajiwara Genta Kagesue and Danshichi in the dramas "Hirakana Seisuiki" and "Yadonashi Danshichi Shigure no Karakasa". 5th lunar month of 1847: Gadô plays at the Ônishi no Shibai the roles of Kanki, Issun Tokubê and the Tedai Tôbê in the dramas "Kokusen'ya Gassen", "Natsu Matsuri Naniwa Kagami" and "Chirashigaki Koi no Tamazusa". His stage partner in the roles of Watônai ("Kokusen'ya Gassen") and Danshichi Kurobê ("Natsu Matsuri") is Nakamura Shikan III. 6th lunar month of 1847: Gadô plays at the Minamigawa no Shibai (Kyôto) the roles of Toki Kurando Yorikazu, Sasaki Gennosuke and the Tedai Tôbê in the dramas "Ôtô-no-Miya Asahi no Yoroi", "Nagara Chôja Uguisu Zuka" and "Chirashigaki Koi no Tamazusa". 7th lunar month of 1847: Gadô plays at the Ônishi no Shibai in the dramas "Katakiuchi An'eiroku", "Suma no Miyako Genpei Tsutsuji" and "Koina Hanbei Sato no Iroage". 10th lunar month of 1847: Gadô plays at the Ônishi no Shibai in the dramas "Tôkaidô Koi no Sekifuda" and "Sekitori Senryô Nobori" (in which he plays the role of the sumô wrestler Iwagawa Jirokichi). This is the last appearance on stage for his friend and stage partner Nakamura Shikan III. 11th lunar month of 1847: Gadô plays at the Ônishi no Shibai in the dramas "Katakiuchi Ura no Asagiri" and "Sarumawashi Kadode no Hitofushi" (in which he plays the role of the monkey trainer Yojirô). 1st lunar month of 1848: Gadô's rank in the Kamigata hyôbanki, Hanagata Sanpukutsui section ("a trio of young stars"), is jô-jô-kichi (superior - superior - excellent). The two others actors in this trio are Arashi Rikan III and Jitsukawa Enzaburô I. Gadô plays at the Chikugo no Shibai 4 roles in the drama "Ishikawazome"
3rd lunar month of 1848: Gadô plays at the Chikugo no Shibai the roles of Ashikaga Yorikane and the sumô wrestler Tetsunosuke in the drama "Meiboku Sendai Hagi". 5th lunar month of 1848: Gadô plays at the Ônishi no Shibai the role of Fukuoka Mitsugi in the drama "Ise Ondo Koi no Netaba". He falls ill at the end of the performance. 11th lunar month of 1848: Gadô performs at the Minamigawa no Shibai (Kyôto) the roles of Gappô and the monkey trainer Yojirô in the dramas "Chûkô Homare no Futamichi" and "Sarumawashi Kadode no Hitofushi". 5th lunar month of 1849: Gadô plays at the Chikugo no Shibai the roles of Kôbê and Tokushima Gohei in the drama "Akiba Gongen Kaisen Banashi". 8th lunar month of 1849: Gadô plays at the Chikugo no Shibai the role of Tôkichi in the drama "Gion Sairei Shinkôki". The roles of Matsunaga Daizen and Princess Yuki are played by Asao Yoroku I and Sawamura Kitô II. 9th lunar month of 1849: Gadô plays at the Chikugo no Shibai the roles of Momonoi Wakasanosuke, Hayano Kanpei and Ôboshi Yuranosuke in the classic "Kanadehon Chûshingura", which is staged to commemorate the 12th anniversary (13th memorial service) of late Kataoka Nizaemon VII. Gadô's stage partners are Mimasu Daigorô IV, Ichikawa Shikô III, Sawamura Kitô II and Nakamura Daikichi III. 11th lunar month of 1849: Gadô plays at the Kitagawa no Shibai (Kyôto) the roles of Hayano Kanpei and Ôboshi Yuranosuke in the classic "Kanadehon Chûshingura". He also plays the role of the yakko Tsumahei and Shinshichi in the dramas "Shin Usuyuki Monogatari" and "Oriawase Tsuzure no Nishiki". 1st lunar month of 1850: Gadô plays at the Ônishi no Shibai in the dramas "Keisei Hana Ikada" and "Tamamo-no-Mae Asahi no Tamoto". 5th lunar month of 1850: Gadô plays at the Ônishi no Shibai the roles of Musashi and Danshichi in the dramas "Ganryûjima" and "Yadonashi Danshichi Shigure no Karakasa". 8th lunar month of 1850: Gadô plays at the Ônishi no Shibai the roles of Hayase Iori and Kôemon in the drama "Tengajaya-mura". 10th lunar month of 1850: Gadô plays at the Ônishi no Shibai the role of Ono no Tôfû in the the drama "Ono no Tôfû Aoyagi Suzuri". He also plays the role of Mohei in the drama "Daikyôji Mukashi Goyomi". The role of Mohei's lover Osan is played by Nakamura Daikichi III. 1st lunar month of 1851: Gadô plays at the Kado no Shibai the role of Oguri Hangan in the drama "Hime Kurabe Futaba Ezôji". 3rd lunar month of 1851: Gadô plays the role of Matahei in Chikamatsu Monzaemon's drama "Keisei Hangonkô", which is performed in Ôsaka at the Wakadayû no Shibai. His stage partners are Nakamura Karoku I (Otoku) and Asao Yoroku I (Shôgen). 1st lunar month of 1852: Gadô plays at the Minamigawa no Shibai (Kyôto) the role of Fukuoka Mitsugi in the drama "Ise Ondo Koi no Netaba". His stage partners in the role of Okon and Manno are Nakamura Tomijûrô II and Nakamura Jakuemon I. Spring 1852: Gadô plays at the Chikugo no Shibai the roles of the priest Seigen and Tôyama Jinzaburô in the drama "Keisei Iriai Zakura". He also plays the role of Kameya Chûbê in the shinjûmono "Koi Bikyaku Yamato Ôrai". The role of Chûbê's lover Umegawa is played by Arashi San'emon IX. 3rd lunar month of 1852: Gadô performs at the Naka no Shibai in the drama "Hana Kaede Ogura no Shikishi". He also plays the role of Omine in "Ise Ondo Koi no Netaba". The performance is a commercial failure. 5th lunar month of 1852: Gadô plays at the Minamigawa no Shibai (Kyôto) the role of Gengorô in the drama "Ôshimadai Oguri Hangan". 10th lunar month of 1852: Gadô plays at the Naka no Shibai 3 roles, including Ohatsu, in the drama "Kagamiyama Sugata no Utsushie"; the roles of Onoe and Iwafuji are played by Nakayama Nanshi II and Mimasu Daigorô IV. 11th lunar month of 1852: Gadô plays at the Minamigawa no Shibai (Kyôto) 2 roles, including Ohatsu, in the drama "Tsugiawase Koshiji no Ume", which belongs to the "Kagamiyama" world; the roles of Onoe and Iwafuji are, just like the previous month in Ôsaka, played by Nakayama Nanshi II and Mimasu Daigorô IV. 1st lunar month of 1853: Gadô's rank in the Kamigata hyôbanki, Tokokazari Sanpukutsui section ("A trio of perfect decorations for a Toko no Ma"), is shi-jô-jô-kichi (unique - superior - superior - excellent). The two others actors in this trio are Jitsukawa Enzaburô I and Arashi Rikaku II. Gadô plays the role of Shigetada in the drama "Kagekiyo", which is performed at the Kado no Shibai. His stage partners are Ichikawa Danzô VI (Akoya) and Ichikawa Ebizô V (Kagekiyo). 1854: Gadô settles in Edo. 3rd lunar month of 1854: Gadô plays at the Nakamuraza the role of Fujiya Izaemon in the drama "Kuruwa Bunshô". The role of the courtesan Yûgiri (Izaemon's lover) is played by Iwai Kumesaburô III. 1st lunar month of 1857: Kataoka Gadô II takes the name of Kataoka Nizaemon VIII. 3rd lunar month of 1859: Nizaemon plays at the Nakamuraza the roles of Shibaroku, Daihanji no Kiyosumi and Fukashichi in the classic "Imoseyama Onna Teikin". 1st lunar month of 1860: Nizaemon plays at the Nakamuraza the role of Fujiya Izaemon in the drama "Hatsu Tayori Kuruwa Bunshô". The role of the courtesan Yûgiri (Izaemon's lover) is played by Onoe Kikugorô IV. 4th lunar month of 1860: Nizaemon plays at the Nakamuraza the roles of Ôboshi Yuranosuke [print], Kô no Moronô and Kakogawa Honzô in the drama "Kanadehon Chûshingura". The role of En'ya Hangan is played by Nakamura Fukusuke I. 12th lunar month of 1861: Nizaemon plays the role of Matahei in Chikamatsu Monzaemon's drama "Keisei Hangonkô", which is performed at the Nakamuraza. His stage partners are Ichikawa Dannosuke V (Otoku) and Seki Sanjûrô III (Shôgen). 10th lunar month of 1862: Nizaemon goes back to Ôsaka, taking back the name of Kataoka Gadô II. 16th day of the 2nd lunar month of 1863: Gadô dies in Ôsaka. Kataoka Nizaemon VIII was an outstanding nimaime, who also excelled in the jitsugotoshi, katakiyaku or oyajigata (in the last years of his career), roles. He was also able to perform occasionally onnagata roles. He gained fame in both the Kamigata and the city of Edo.